Yingli Green Energy (YGE) is one of the oldest Chinese companies and is completely integrated. One of the world’s first fully vertically integrated photovoltaic manufacturers, the company develops, manufactures and sells high-quality modules under the brand Yingli Solar to a wide range of markets including Germany, Spain, Italy, Greece, France, South Korea, China, and the United States. The company is headquartered in Baoding, China with over 11,000 employees worldwide & more than 10 branch offices globally. The business model covers the entire PV value chain, from polysilicon production to the assembly of modules. Yingli Green Energy (YGE) is one of our top picks to buy in 2013. This Chinese company provides modules at cheap prices. The cell types found in Yingli modules is generally 156×156 mm, whereas in Canadian Solar they are 125×125 mm and 156×156 mm. Weight for Yingli modules is between 15 kg to 21 kg. 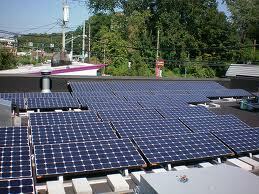 Canadian Solar panels have weight in the range of 15.5 kg – 27 kg. Anodized aluminium alloy frame is used in Yingli Green solar modules and Canadian Solar panels. The BIPV modules of Canadian Solar have no frame. Canadian Solar Panels come with 10 years product warranty (materials and workmanship) and 25 years linear module power output warranty. Yingli Green Energy modules come with 10 years limited product warranty and limited power warranty of 10 years at 91.2% of minimal rated power output, 25 years at 80.7% of minimal rated power output. Canadian Solar panels come with the top ranked PVUSA (PTC) rating in California for higher energy production. Yingli Green modules are certified under IEC 61215, IEC 61730, MCS, CE, ISO 9001:2008, ISO 14001:2004, BS OHSAS 18001:2007, SA 8000, PV CYCLE. Read other technical details of solar modules of both the brands here: Canadian Solar and Yingli Green Energy. Interesting. Just one note, I see Canadian Solar is SA 8000 certified. This is a standard for the labor conditions. Well, when I visited their factory and talked with workers there, there was for sure a violation of labor conditions. “11 hours”, and “30 days ago” was the answer I got from a young lady worker when I asked her how many hours per day she works, and when was her last day off.